20) GET YOUR HEAD IN THE GAME! Today’s prospecting environment requires new solutions to old problems. In today’s environment, only a systematic approach to relational marketing and prospecting will keep you in sales. A: To reach executives effectively, keep three things in mind. First, you have to relate to these individuals. Two, you need to speak their language. Third, you must recognize that they are typically screened from any unwanted calls and/or mail. The best way to get their attention is to involve yourself in the activities and organizations that they support. As an example, the Senior Vice President of Marketing will most likely be involved in the American Marketing Association. The CFO will be involved in the CFO Society, heads of communication in IABC, etc. belong to, ask executive clients to have or refer to Gale’s Encyclopedia of Associations regional edition (1800-877-GALE). Jonathan Lindley is currently one of the majority share owners of River Rock Real Estate, one of the the premier boutique agencies in the Rio Grande Valley. To learn more about Jonathan Lindley and River Rock Real Estate call 956-929-1583, email jonathan@lindley.realtor or visit riverrock-realestate.com www. 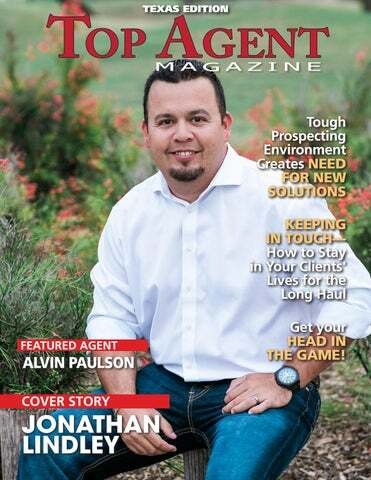 on being featured for the state of Texas in Top Agent Magazine! Matthew T. Wilson, CESP | Vice President- Escrow Sierra Title of Hidalgo County, Inc. 3401 N. 10th Street, McAllen, Texas 78501 Phone: 956-682-8321 | Fax: 956-682-6150 sierratitle.com www. INDIVIDUAL PERSONAL CONTACT One of the best ways to keep in touch with your clients is to simply give them a call every once in a while. Follow up and see how your clients are doing. Offer them assistance if they need it. Personalized contact helps to ensure that you remain as important to your clients long after the sale as you were during the transaction. Giving your clients a call on special occasions such as birthdays or holidays also makes for a great personal touch. Of course, nothing beats face-to-face contact. Stopping by to say hello can be a great way to keep in contact. An even better way to catch up and maintain that friendship is to set up a lunch or coffee date with past clients. Giving individual clients your undivided attention goes a long way towards maintaining that bond you formed during the transaction and earning your client’s loyalty and trust. Interactions like this make a lasting impression on your clients. Of course, many busy REALTORS® may not have time to follow up with every client oneon-one. A great way to still give personal attention to your clients without meeting each and every one for lunch is to throw a client appreciation party. This allows you to get in some face-to-face time with each client and make sure they all get your undivided attention and quality time to catch up with you, even if it’s only for a short time. Now, if you have a lot of past clients, this can be difficult to manage during one party. One way to get around the numbers problem is to organize smaller events based on client’s interests. Instead of throwing one giant party, host a pool party for the families with kids or a wine and cheese get together for single clients. Hosting special events like these ones goes a long way towards keeping your contact with past clients more personalized and setting you apart from those businesses that simply send them a calendar once a year. housing market. Demonstrate your knowledge about the community and the things that are important to your clients. Include information about local cultural events, community news, housing statistics, information on the mortgage market, home maintenance advice, home design tips, and anything else that your clients will find personally useful. Your clients will always be interested in value. SPECIAL BIRTHDAY CARDS: Instead of just sending your typical birthday card, add something special to yours that will stand out. Include a $1 scratch off ticket or a $5 gift certificate to Starbucks. Make sure to include a handwritten personal note. Social networking sites make staying in contact with past clients in a more informal and friendly basis much easier. Connect with your past clients on Facebook. This will help you stay up to date on the important things happening in your pact clients’ lives. In return, it provides you a great platform for keeping those past clients up to date with what is going on in your business as well as keep in contact in a more informal manner. Use Facebook to remind past clients to check their basement after a heavy rain or that they can contact you for help during tax time. You can even organize your contacts on Facebook into customized lists such as “past clients,” “industry contacts,” etc. This will help you better manage your Facebook contacts. This will also allow you to view specific news feeds based on these lists and send messages to a particular list of contacts. Don’t forget about the many other social networking sites such as Twitter or LinkedIn either. Utilize this technology to drive personal contact with your clients. they know, like and trust,” he says. That’s certainly been true for him. Repeat and referral clients account for 76 percent of his business. With his team—an administrative assistant, a buyers’ agent and his wife, Jennifer, who works more on the listings side with him—he primarily serves Dallas and the north suburbs. Alvin spares no effort in marketing his listings, starting with staging, high resolution photos, aerial photos (as needed) and virtual tours; then advertising on various social media outlets. Finally, he and his team hand-deliver all their listings, on a weekly basis, to the 17,000 real estate agents in the area. 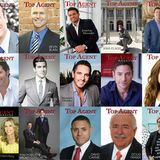 “We want to make it easy for all those agents to be exposed to our properties,” he explains. Alvin makes sure he stays in front of his clients with monthly touches such as emails, flyers, client parties and stopping by to drop off quarterly or holiday items. He loves connecting with them. “Everybody has a different story, and the story is intriguing,” he says. “These are everyday people doing everyday things. We help them achieve their goal of buying or selling a house. It’s really gratifying.” Relaxing is a gratifying piece of Alvin’s success formula too. For him, it means living an active lifestyle: playing golf, cycling, running or vacationing with his family. But thoughts of business are never far away. His goal for 2017 is to grow his team, not only through his personal production but also by mentoring young agents, which he discovered is more gratifying than he anticipated. But that’s Alvin, finding gratification everywhere he looks. For more information about Alvin Paulson of Paulson Residential, Dallas, Texas, visit AlvinPaulson.com, call 469.644.8558 or email Alvin@PaulsonRes.com www.